This is probably my *most favorite* project thus far for the holiday season! 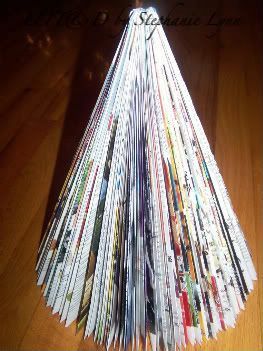 I thought these magazine/book trees were something new; however, they have been around for ages. I love the whimsical vintage look they have…they make my heart pitter patter! You want to start with a magazine or soft cover book. 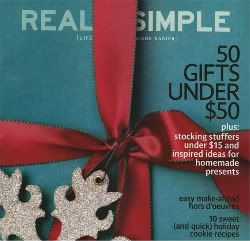 I used a Real Simple Magazine ~ the colored pages are amazing; however a black and white print would also look fabulous! You want to roll the binding back and forth to break the spine and make it pliable to work with. 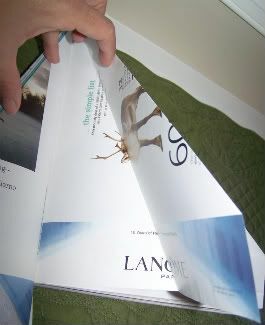 Step One ~ You want to fold each page into the spine of the magazine staring with the upper right hand corner of each page. Once you work your way around the entire magazine you will be left with this shape. Step Two ~ Taking each of the pages you have just folded, you want to make a second fold. 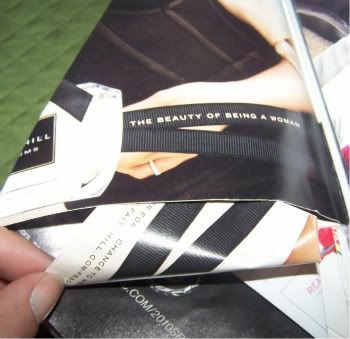 Starting with the upper right hand corner of each page, fold again into the spine of the magazine. 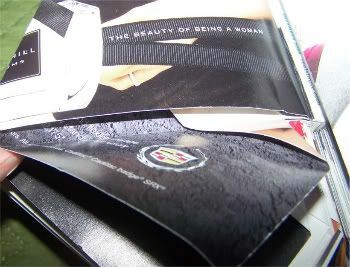 Once you have gone through all the pages your will be left with a cone shape. Step Three ~ This step will give your tree a nice flat bottom to sit upon. You want to take the triangle bottom and fold it up to create a straight fold. 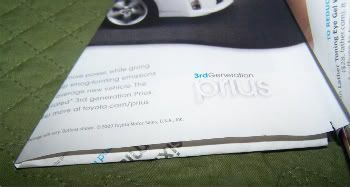 Then you want to tuck the triangle back into the page. Once you get a couple pages done this will become easier ~ so hang in there! Work your way around the entire tree and it will take a tree shape on its own. I used Krylon Spray Adhesive to lightly coat the pages and then gave a dusting of the Vintage Mica Glitter for a little sparkle. 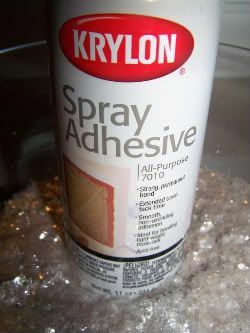 You could even spray paint your favorite color to match your decor. Thanks so much for this! 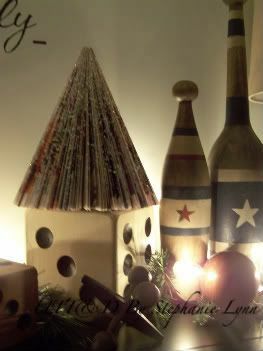 That vingette is adorable (I have some of those boxes and things, too), and this is a very cute idea! I love the magazine trees. That’s new to me! How cool! I saw that episode of Martha last week! I was searching for the perfect magazine to use for it! 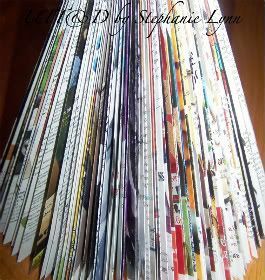 I love the idea…I always feel guilty even throwing magazines in the recycling bin so this makes me feel better! This is really cute! I’ve never seen these before! Thanks for sharing. That is adorable. I have plenty of magazine I could use. What a great idea! And easy on the wallet! Cute! 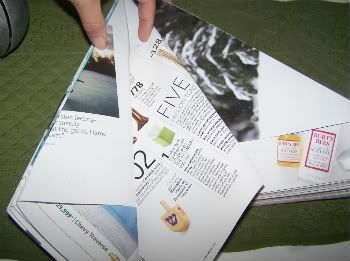 I just did it with a junk mail catalog, and learned that I really need three of those type of catalogs in order to make it full enough for a full circle. A great project for downtime at work! Now that’s original & beautiful & your photos are gorgeous! Stop by and see my creation this week and let me know what you think! That looks great in your son’s room. Thanks for the tutorial. Great idea. 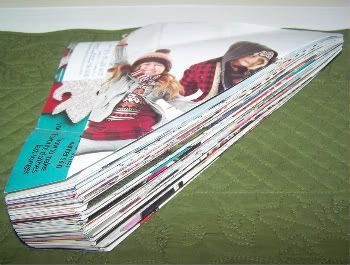 I have tons of magazines!!!!!!!!!! seriously, one of the best ideas i’ve seen this season! love it! i am filing yet another one of your fab ideas at thecraftersfilebox.com. thanks for saring! We used to make these at my grams way back in the early 80’s using her old tv guides! I sure wish I still had them! Oh I am all over this!! 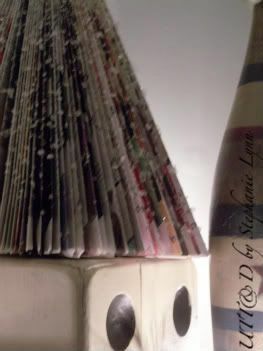 I just posted last week how I made candles by folding magazines. I knew trees would be fun but I didn’t know how to make the folds. Thank you so much for the How To!! Very cute! That is so cute!! Great job! This takes me back to the 3rd grade when we did this with Phone Books!!! Love it! 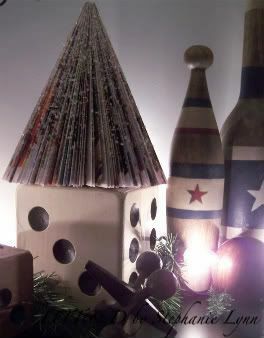 I also love your huge dice and vintage bowling pins! too cute! thanks for linking! Love this project! You are so creative…thanks for linking up with 2nd Time Around! These were all the rage when I was in college in the mid 60s – we painted them white, red, gold, silver and even green, then added tiny paper chains, tiny snow flakes and sometimes bits of cotton balls for snow. Depending on color and trims they were cute, playful, and even elegant. Still love them and glad they’re back. Great to do with (grand)kids altho they probably won’t last for all the folding. 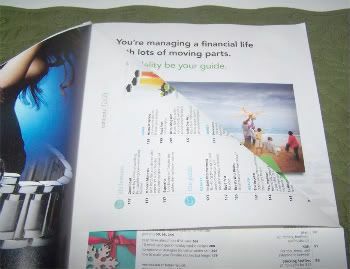 I did this tonight with a Cooking Light magazine. It looks super cute even without the glitter (but I’ll be getting some tommorrow). Thanks for sharing the idea! SOOOO COOL! !I absolutely think this is the BEST idea. 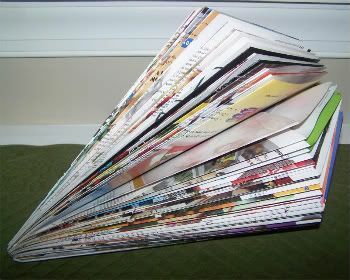 Excellent way to recycle a magazine too. Thank yo SO Much for the “how to”. that is absofreakinlutely awesome!!! I so need to make some of those! Oh I SO LOVE this idea. Creative beautiful and recylcling to-boot. BRAVO !!! Thank you do much for sharing and have a GRAND weekend. Great idea! Reader’s Digests makes great trees! I featured this at somedaycrafts.blogspot.com Grab my ‘featured” button. I made these as a kid. Now, I like the recycled look of them. What a neat idea! Easy and cheap decor. Great recycling idea! Very clever! Love it! love these. They take me back to childhood. Me and my kids just made santa and mrs.claus out of readers digests. My mom still has hers on her piano every year, so we made our own this year. Fun. If I can figure out how to put pics up I will post some. Wow! Too clever! I’d love to give this a try! Thanks for linking to [email protected]! Folding is something I would like to do in order to get such a gorgeous craft! 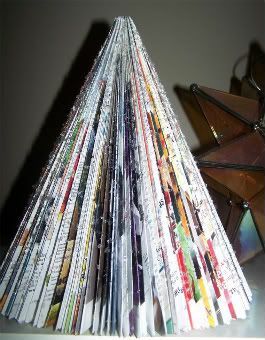 I used to make these from old telephone books when I was a child; however, I folded mine to make four tiers so that it looked like a Christmas tree. My mother helped me by spray painting my tree green and I glued “ornaments” from colored construction paper using a hole punch onto my Christmas tree. This is a great project for kids of all ages.